Gospel means “good news.” The four Gospels were written by Mathew, Mark, Luke and John. The Gospels explain why Jesus was so important to each of the writers and set out what Jesus taught. For example St. Mathew’s Gospel (Chapters 5-7) reports on Jesus’ Sermon on the Mount. This sermon covered matters as varied as divorce, murder, loving one’s enemies and giving to the needy. The Gospels are not a complete record of Jesus’ life. They describe particular events in it, especially those immediately leading up to his death and resurrection. 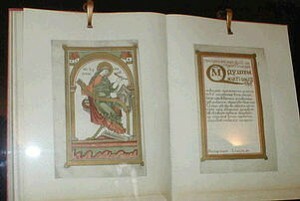 The Gospels are important for the information they contain and because they are unique. They are the only specific records that exist of Jesus’ life and teaching. The Gospels also report Jesus’ miracles (These are out of the ordinary events). St Matthews Gospel describes the miracle of the Virgin Birth, St. Mark’s Gospel describes the miracle of the feeding of the five thousand (Chapter 9 verses 2-17). St. John’s Gospel describes the miracle of a dead man, being brought back to life (Chapter 11 Verses1-4.) Miracles are seen as signs of God’s power and therefore evidence that Jesus was the Son of God. (Many Christians believe in these miracles. Some believe that they happened, but that there is a rational explanation for them. Others believe that they did not happen but and are just symbols used to explain difficult ideas. The Gospels are particularly important to Evangelical Christians. Evangelism involves the sharing of the Gospel and Evangelical Christians are keen to inform others of the message of the Gospels whenever possible.